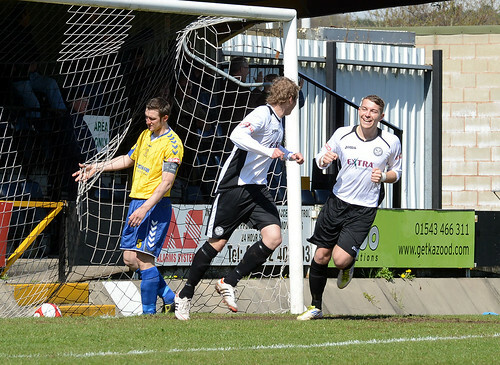 Hednesford Town comfortably overcame Stocksbridge Park Steels to ensure the Evo-Stik Northern Premier Division title race goes to the final weekend as an early strike apiece for Elliott Durrell and Neil Harvey ensured The Pitmen continued their valiant effort to keep pace with North Ferriby United. The Villagers won 1-0 against Chorley but, with Hednesford recording their eighth win in ten matches since losing 3-2 to their title rivals in March, Rob Smith’s team go to Fylde next week needing to win and hoping Ferriby drop points at home to Ashton United. Durrell’s deflected shot opened the scoring within thirty seconds as the home team heeded their manager’s call to start brightly to ensure the nervous atmosphere around Keys Park didn’t impede their progress. Within 6 minutes their lead was doubled as open build up play got Harvey into the right hand channel and his shot rolled into the net via another deflection beyond the static Ben Scott. Hednesford continued to dominate the first half with Ben Bailey seeing his header cleared off the line and Durrell shooting wide when well-placed. Goalscorer Harvey was carried off after a totally unnecessary tackle by Matthew Telling earned him a deserved red card just before the break, but with the Pitmen supporters hoping for a more convincing win Stocksbridge showed admirable desire in keeping the score down. 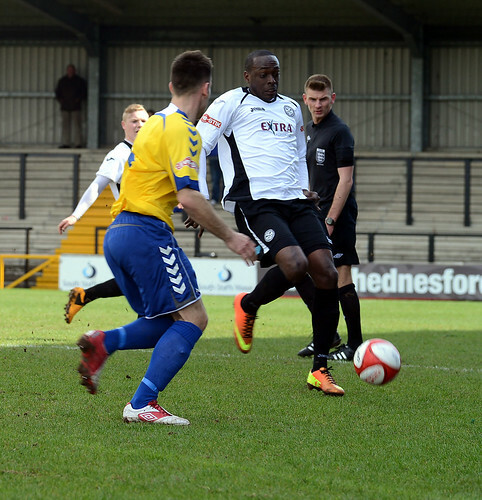 Francino Francis made the game safe for Hednesford as he nodded in unchallenged on 51 minutes but the expected rout from the home side failed to materialise despite a sensational passing move ending with Jamey Osborne hitting the post on 65 minutes. Danny South saw a second yellow for a crude foul on Osborne but the arrears were reduced when Alex Callery’s shot was superbly saved by Dan Crane and Nathan Joynes slotted in the rebound on 69 minutes. By the end of the game The Pitmen had no less than five attacking players on the pitch but they struggled to open the play up against determined defence. Durrell easily converted his 13th penalty of the season late on after a Steels defender handled a goal bound shot in the final three minutes and the players were given a standing ovation as they left the Keys Park pitch for what could be the final time this season. Should North Ferriby win next Saturday to prevent Hednesford catching them at the summit of the Evo-Stik Northern Premier Division The Pitmen will have a home tie in the play-off semi final against one of either Witton Albion or most likely Fylde on Tuesday 7th May with a possible home play off final on Friday 10th or Saturday 11th May.